Rowland started in the fancy over seven years ago, joining CRCI, RBA of NSW and RFSNSW. Living in Narromine in the central west of NSW Rowland has to travel a minimum of 400km to the nearest show venue. He has travelled extensively to all NSW clubs exhibiting at in excess of 20 shows a year and enjoys the camaraderie of the fancy and the competition to better stock standards. Rowland specialises in rare breeds, starting with Dutch and soon after adding Silver Fox. From there he has added Tans, Chinchillas. Sables and Smoke Pearls. He also breeds Standard Rex in ermine and castor and has a few mini Rex in the mix as well. He has bred Thriantas for about four years, producing one buck which achieved the status of 4X Supreme Champion gaining over 105 stars on the show table. Rowland has produced multiple best of breed winners in all the breeds he has shown. As well as having four BIS wins with Silver Fox, he has had BIS wins with Chinchillas and a Sable and twice a runner-up BIS with a Tan. 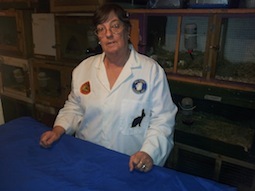 In early 2012 Rowland was co-founder of the Orana Rabbit Fanciers club based in Dubbo. 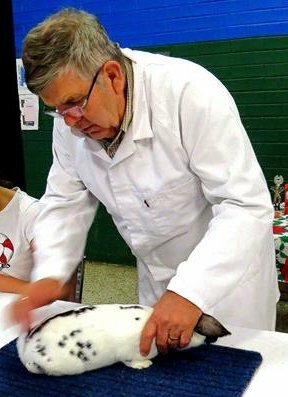 The club was formed to cater for rabbit enthusiasts throughout the central west of NSW and now has members from Dubbo to Moree and Lithgow. It has been successful and conducts three shows a year. Rowland is looking forward to judging in SA to see new stock and put some faces to the many names that he has encountered and heard of throughout the fancy. I was born and breed in Kalgoorlie, Western Australia. Move to Perth with parents at the age of 17. While working at Aherns met Michael and married several years later, and moved to Kambalda (not far from Kalgoorlie). Had our daughter Natasha two years later, moved back to Perth when she was 4 years old. When Natasha was 17 years old she asked if we could have a cat, but Michael didn’t want one as didn’t at that time like them. After a lot of research on her part and going to a couple of shows she was allowed a rabbit. Within 3 months we all had rabbits and started breeding and showing. We were all under the Stud name of ‘Ashrose’, When Natasha moved out Michael & I applied for our own stud name ‘Dreamchaser’. He is a big part of the rabbits with me. After several years of showing I started training to be a judge. Have been a judge now for around 5-6 years. My first rabbit was a Tri Dutch. Then Dwarf Lops & Rex. 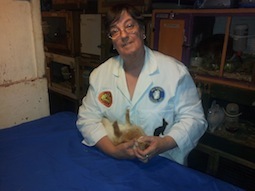 Also over the years have had Californians, Cashmeres, Swiss Fox, Mini Rex, Silver Fox, Smoke Pearls, Netherands, Satins. Currently breeding Polish, Mini Rex, Rex and Satin Rex, Tans. Found it a great help to have the different breeds while doing Judge training. Have been a WARCI & HRC committee member for around 12 years. 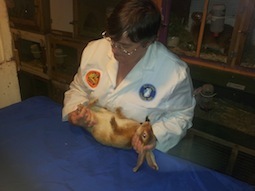 Having the rabbits has been wonderful therapy for me as I had a mild heart attack in our first year of breeding and showing. Still have problems, plus back, arthritis. Two years ago I had an operation and almost died, and has changed my lifestyle. If I didn’t have the rabbits I think it would have taken me a lot longer to recover. Even though I have bad days, I will always feed, water and clean the rabbits and our other animals. Also very grateful to be here to see my two lovely grandsons. This hobby has also given me wonderful friends here in WA as well as the Eastern States. My other hobbies are Sewing, Crocheting & Cooking Cakes, Desserts & Biscuits.